Buckboard wagons have been part of Amish culture and art for centuries, and it's easy to see why! With handcrafted, solid wood construction and fully-functional wheels and hitches, this large, premium-grade wagon is as versatile as it is stunning. This buckboard wagon is perfect for using on the farm or for displaying seasonal decorations such as pumpkins or Christmas Santas. You could even use this wagon for a parade and add a metal or wooden shaft with a nylon harness for a horse to pull. 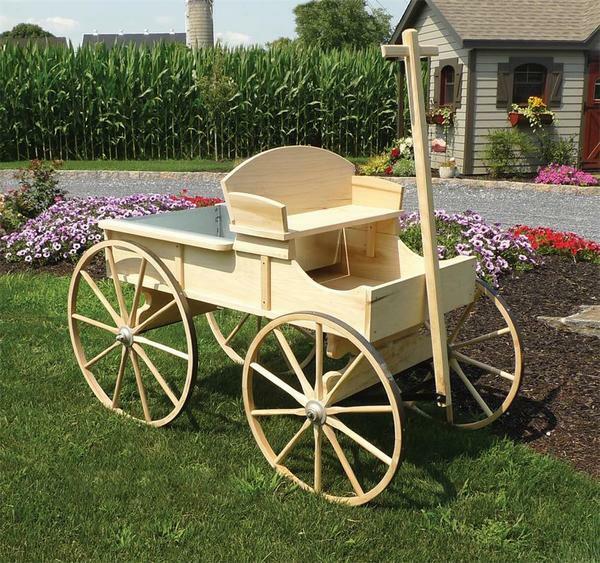 This wagon is crafted from hand-selected wood and finished to an incredibly high standard. Customize the look by choosing your finish as well as our other many options. If you have questions or would like to place an order, please give us a call at 1-866-272-6773 or stop by our Amish furniture store in Sarasota, Florida near the Amish community of Pinecraft. Width without Lip: 22 1/2"
Width with Lip: 25 1/2"